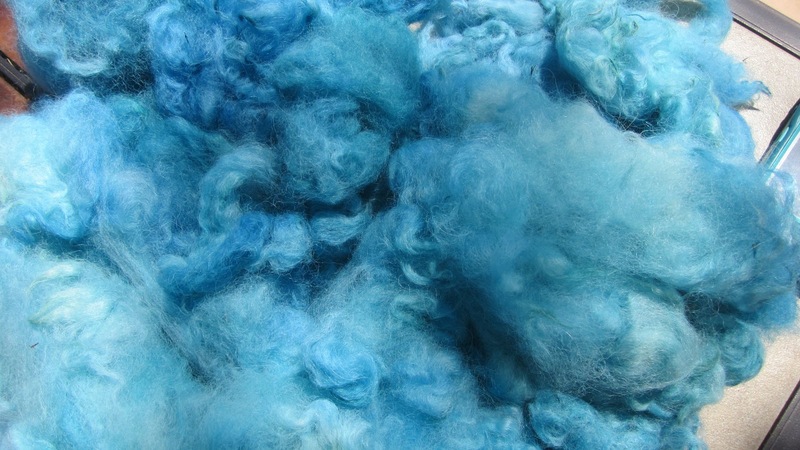 As you might recall from my recent post, Dye Experiment, I had mixed up three separate batches of acid dyes in blue, teal, and turquoise so that I could dye some wool, mohair, and silk in a range of colors. The idea had been stored away in a corner of my mind since I saw a pot containing mason jars simmering away on a wood-fired cookstove, many years ago during a New Hampshire wool arts tour. The tour is still held every year on Columbus Day weekend, just when the autumn leaves are at their most beautiful. Check out the information from last year's tour here. Now that I think about it, I never did see the results of that long-ago simmering dye bath, and now that I have completed my experiment, I wish I could talk with those people to see if the might have had the same problems as I did. 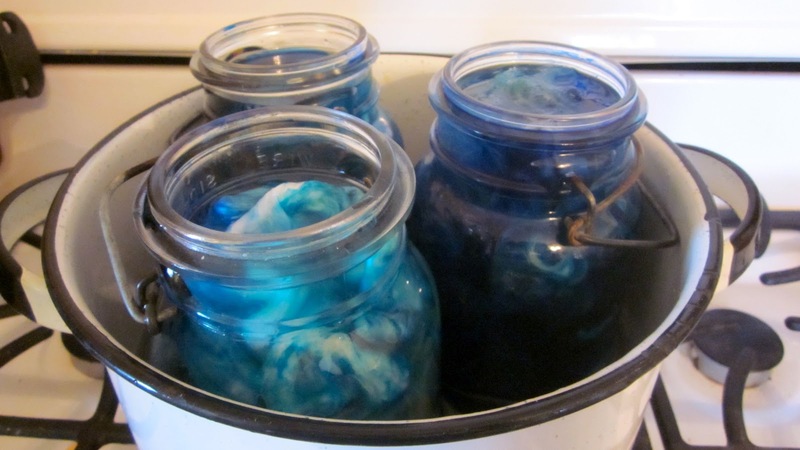 Because the fibers were packed so tightly into the jars, and because I forgot to add salt to the mixed dyes, I wasn't able to "exhaust" the dye--which you know you have done correctly when the liquid becomes clear, since all the dye has gone into the fiber. 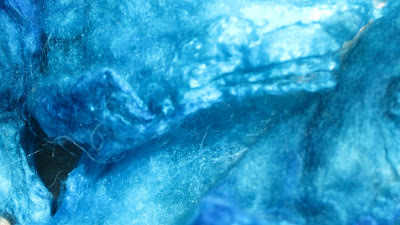 After hours of simmering, I pulled all the fibers out of the jars, turning my hands a nice combination of blue, teal, and turquoise. It was obvious that the dye wasn't set, so I plopped all the fibers into my big pot (no jars this time), and brought them up to a simmer in a solution of water, vinegar, and salt. 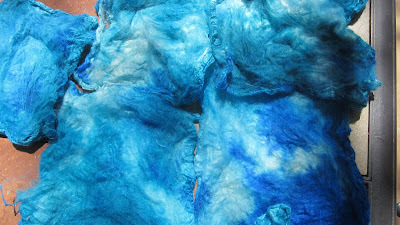 This time the dyes exhausted themselves properly, but of course, I ended up with most one shade of blue that resulted from the three dyes mixed together, with a few patches of pure blue, teal, and turquoise. All of these photos make the colors look way more uniform than they actually are. 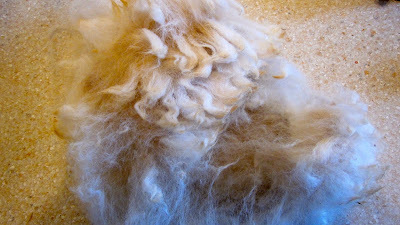 We'll see how the yarns turn out when I get them spun up. No promises about when that might happen, but I'll be sure to let you know when I reach that particular mañana. The next time I try this experiment, I will use three completely different colors - maybe red, blue, and yellow - so that the colors will be a little more distinct. 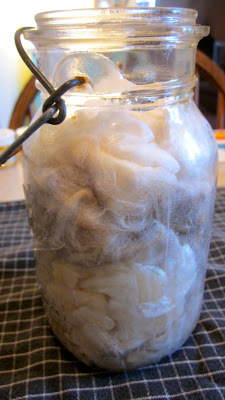 Perhaps I'll pack the fibers into the jars more loosely, and I might even remember to add the necessary salt. Perhaps, perhaps, perhaps. If you should try any dyeing, I would love to hear about the results and see some photos. Now you've got me laughing. Died-in-a-mason-jar reminds me of the book I'm reading, Crazy in Alabama, where the heroine (?) is off on a cross-country crime spree, carrying her murdered husband's head in a tupperware container inside a hatbox (the patented tupperware press and seal keeps leftovers fresher and longer, but not forever, as some feisty chihuahuas just found out). The goings-on back in Alabama with the rest of her family are a bit more serious, just so you don't think I'm a completely frivolous reader. Your title, "How-I-Died-in-a-Mason-Jar," would have been a far better one for the post, although I had considered calling it "I Dye Lots." I've had a little trouble with that blog lately. Not for lack of things to write about, just partly lack of confidence that anyone cares now that we all do Pinterest, and partly lack of get-up-and-go, and partly lack of time due to that never-ending kitchen paint project; not to mention the time I spend reading crime books. 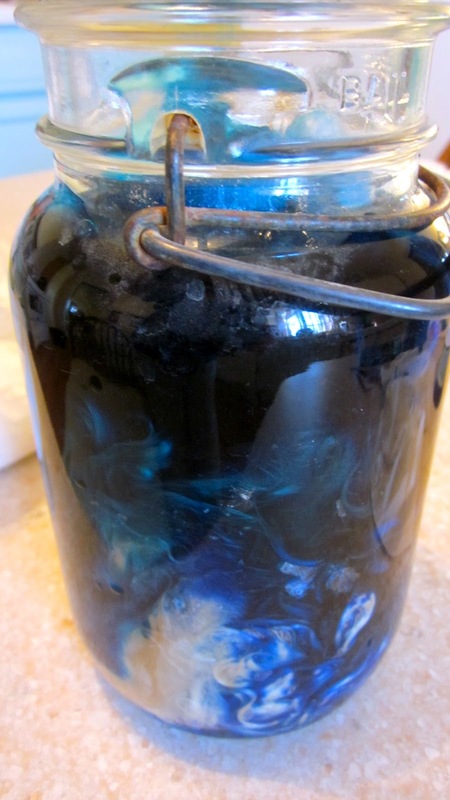 The dye experiment was much more interesting as a process than anything that resulted from it. However, I will soldier on and reveal the less than exciting results. Soon. I read your last email to the knitting ladies today. Not many were there, but all expressed a sense of loss at your empty seat. Page is packing to leave for Tacoma next Monday, so she is done with us. Joanne has been sick with a chest business, but will return soon. Marie is looking more beautiful than any 75-year-old has any business looking. Anita just had a stent put in, which we hope will stop her from fainting in the Walgreen's and scaring the staff and gives the rest of us reason to hope that she won't faint behind the wheel while driving in circles with her poor sense of direction, looking for the church so she can visit the knitting group, since the doctor didn't specifically tell her not to drive. Our Hobby Lobby store was the scene of a box-cutter incident, where a man and a woman were stopped for shoplifting the other day. The woman disappeared inside McDonald's across the parking lot, the hobby staff gave chase and caught up to the man nearby, the man pulled a box cutter and slightly stabbed one of the HL employees, but the others jumped him and held him down until the police arrived. Anita wondered if they were stealing money or yarn (and why, I suppose, since there is so much of the latter). Page is pretty sure that Joanne was the mystery woman, out attending to her life of crime while pretending to be home sick. Joanne wonders why she would be accused of stealing yarn, given the contents of her guest room closet. Although none of the last three knitters were present, we surveyed their opinions by cell. Then I carefully trickled three shades of acid dye down inside each jar. 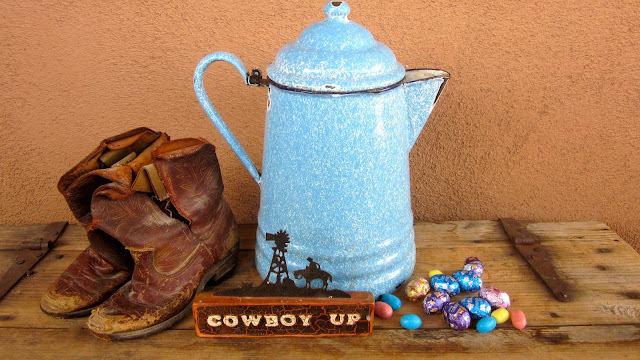 I used blue, teal, and turquoise. 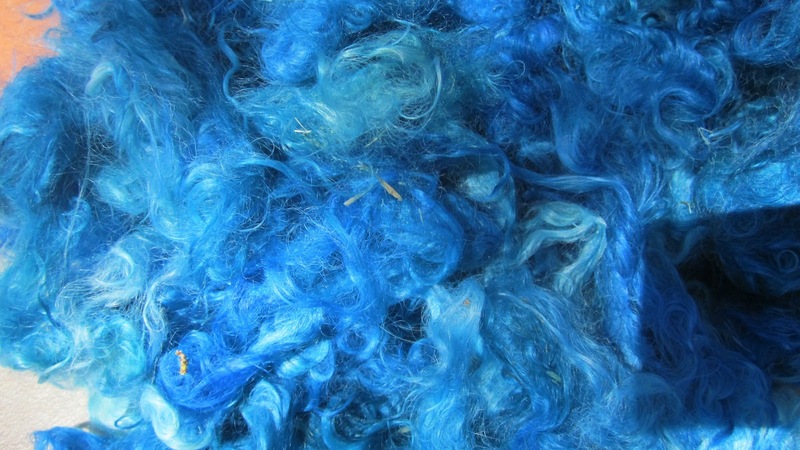 Here is an article about acid dyeing, if you are interested. I hoped that each color would stay a little separate and overlap a little with the other colors for even more shades. 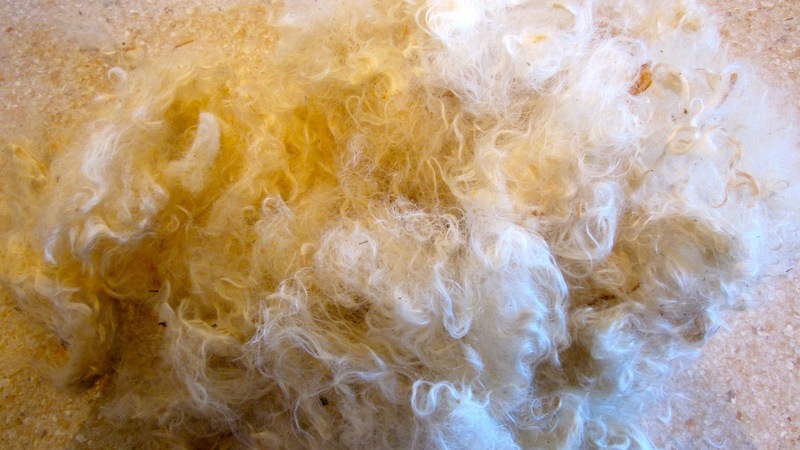 Because the fibers were packed in tightly, some parts would receive more dye than other parts. I love chance and random happenings. At least inside my dye jars, I mean. I added some water and vinegar to each jar, and placed them all in a water bath on the stove to simmer. Although you can't tell from this photo, each jar contains all three fibers and all three colors. 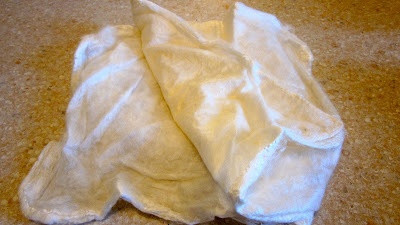 In the next post, I'll show you the results of my dye experiment. My first "real" job--other than babysitting, housecleaning for my mom, and ironing @ 5 cents per shirt for one of my babysitting families--was Assistant Bookmobile Driver at a county library system in northern California. I helped out on the school bookmobile that went to schools that didn't have their own libraries, and I sometimes got to go on the residential bookmobile that I had used when I was a child. It was a marvelous job for a young college dropout (I finished up many years later), and a wonderful introduction to library work. In those pre-computer days, people relied on the librarian to help them find books and to assist them in using the card catalog. We didn't have a full catalog on the bookmobiles, so a good memory was essential at all times. I quickly learned to memorize which books were waiting in the piles to be re-shelved, because someone might be looking for one of them. My scariest moment at that job was when the regular driver, Edna, was out sick and I had to drive the huge, lumbering truck all on my own for the first time. Edna and I had practiced together for just such an event and I was assured by the head librarian that I would do just fine. Everything was going well until I got stopped in traffic on a steep hill. Anyone who has ever driven a standard transmission will remember that awful feeling of scooting your foot from the brake to the gas pedal while letting the clutch out, especially while on a hill: For beginning drivers there is always a sickening moment when the vehicle rolls a bit backwards until either the clutch catches or the car stalls. With such a huge and weighty truck, the roll backwards happened faster and lasted longer, and I was terrified that I would roll back into someone. After several increasingly panicky tries, I finally had to back down the hill and into a driveway, wait for all the traffic to pass and for my heart to stop pounding, and take a running start at the hill. It was a sweaty moment, let me tell you! I mention all this because although you might have missed it, April 11th was National Bookmobile Day, which is part of the annual April observance of National Library Week. During all my years of working in libraries, I somehow managed to miss celebrating National Library Week, part of my general obliviousness to dates and times, no doubt. This year was no different and I missed it again, but I still like thinking about my old bookmobile days. Have you ever had a bookmobile in your life? 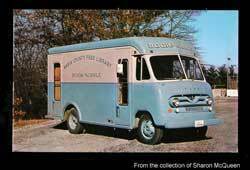 Do you have any bookmobile memories you would like to share in the comments? 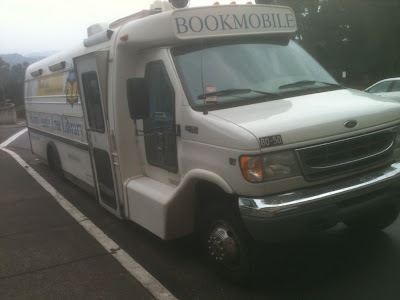 the smaller bookmobile version that is used these days in Marin County. 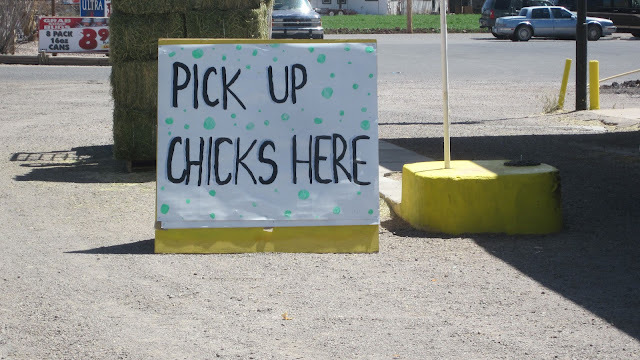 I'll bet it's an automatic! 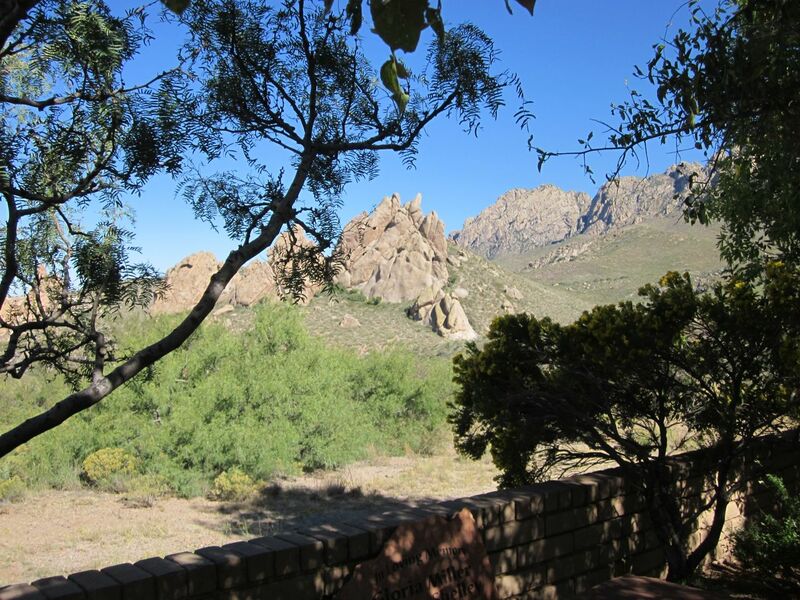 For our Easter breakfast we met with friends at Dripping Springs in the Organ Mountains above Las Cruces. The views were stunning, the air was clear and warm, the company was great, and the food was delicious. We decided to make our Easter Campfire Breakfast an annual event, although I believe that I can foresee some Spicy Breakfast Burrito Picnics in the near future. This is the way the Rio Grande has looked all winter: Dry and empty. People walk their dogs and fly kites in the riverbed. That sign warns people not to swim because of the strong current. No problemo. The Rio is a managed river, no longer allowed to run free. 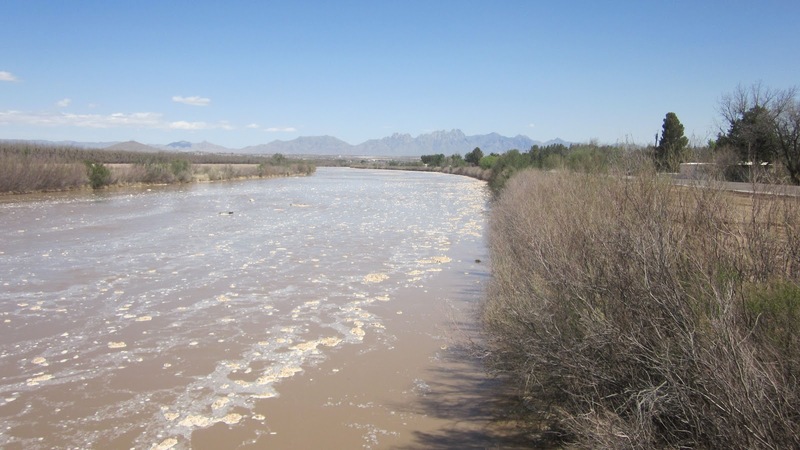 Snowmelt and runoff is stored upstream from here in reservoirs; water treaties between Mexico, Texas, and New Mexico determine who gets how much when the water is released. 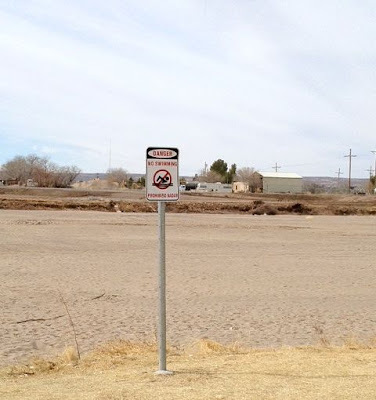 Our governing body here in southern New Mexico is the Elephant Butte Irrigation District (EBID), which allots water to farmers and determines when the water will be sent down the river bed to them. 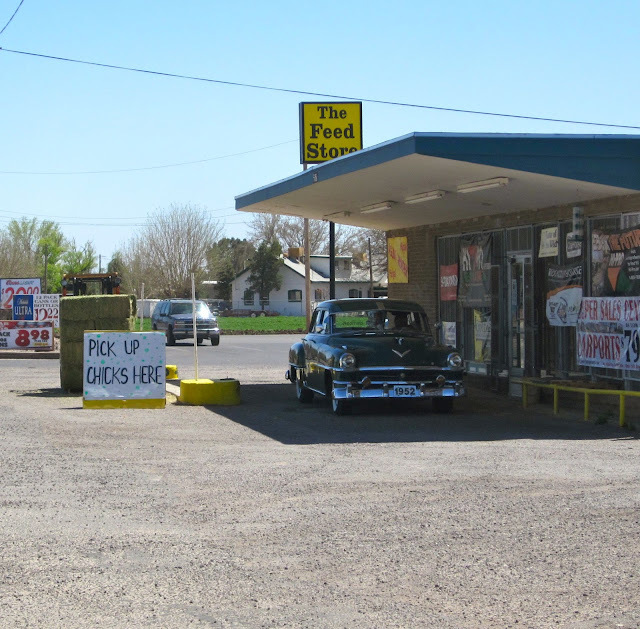 This year southern New Mexican farms will get only 8 acre inches, up from 3 acre inches last year, but way below the usual 3 acre feet in good years. We went to see the newly flowing water, all silty and sludgy, as it made its way down the other day. This is a water event comparable to something like ice-out on Lake Winnipesaukee back in New Hampshire. Big problem, though: None of this water is meant for the farmers here or in Texas, right now. 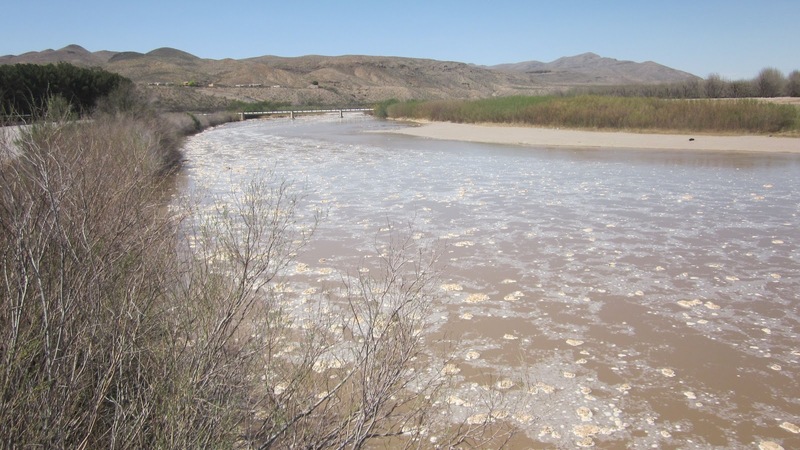 EBID had originally scheduled the release for everyone's water all at one time in mid-May, but there was some kind of communications problem and the farmers in Mexico still expected to receive their water at the usual time, right about now. Because the Mexican farmers weren't given enough notice to make other plans to pump from groundwater until the May release, they demanded (within their rights by treaty) to have their water sent now. 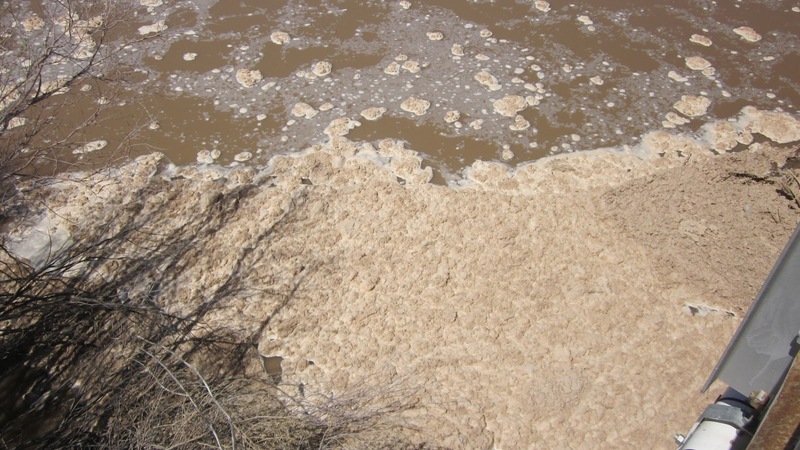 The water in these photos will pass through New Mexico and Texas on its way to Mexico and there will be plenty lost to evaporation and through sinking into the dry riverbed. By the time they start getting their water in mid-May, the farmers here in New Mexico will have lost yet another precious acre inch of this year's scarce water allotment because of this earlier release to Mexico, and will have to pump that much more from their wells, pulling water from the underground reserves in the aquifer. Pumping is expensive, the aquifer is shrinking, and deeper pumping costs even more. Local farmers are having to drill new, deeper wells to get to the water they need for irrigation. 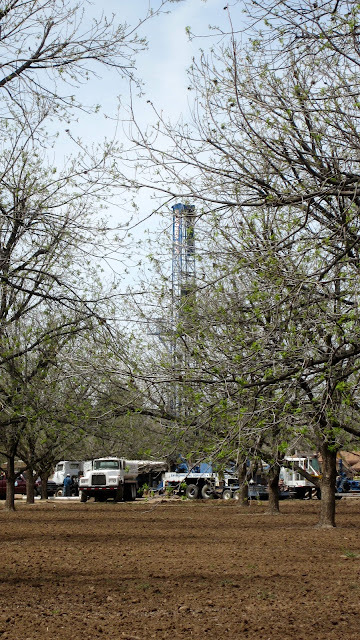 Here is the drilling rig out behind our place in the pecan orchard; it's been working for days, drilling deeper and deeper for precious water.